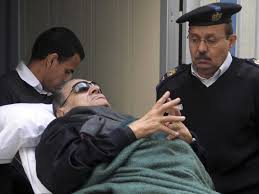 Former Egyptian President Hosni Mubarak has been released from prison after appealing against his detention. He was taken by helicopter from Cairo’s Tora prison to a hospital and is later expected to be put under house arrest. Mr Mubarak, 85, still faces charges of corruption and complicity in the killing of demonstrators during the protests that toppled him in 2011. His release is seen by many as a sign that the military is rolling back the changes that flowed from the uprising. Egypt is currently under a state of emergency amid the bloodshed which has accompanied the military-backed interim government’s crackdown on Islamists opposed to the army’s ousting of Islamist President Mohammed Morsi on 3 July. Hundreds of members of the Muslim Brotherhood, to which Mr Morsi belongs, have been detained, including its most senior leader Mohammed Badie, who was wanted over alleged incitement to violence and murder.